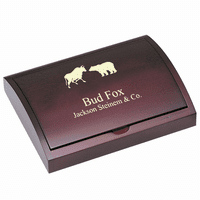 Carry your business cards in style with this bull and bear emblem business card case. 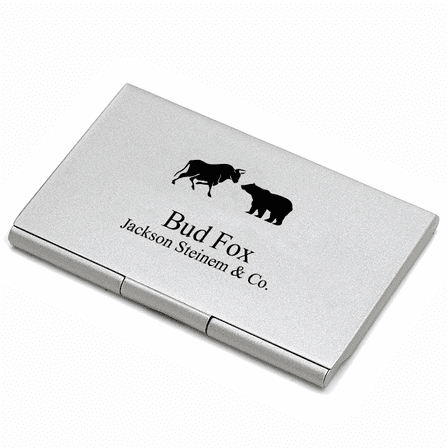 Made specifically for finance professionals, it comes with a laser engaving of the classic bull and bear emblem, the symbol of wall street. 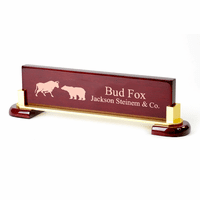 Next to this emblem, add your own custom engraving, perfect for inscribing a name and job title or name and company. 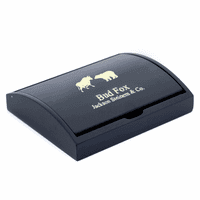 A great gift for stock brokers and traders, this bull & bear card case comes packaged in a gift box. For the price, this item is not bad. The only thing that i didn't like, is that the picture gives the impression that the bull/bear logo and inscription is in black....and when i received my order, it was engraved in a dark gray. So it does not look as clear and bright as the picture. Again...for the price, it's not bad...just disappointed about the color of the image. 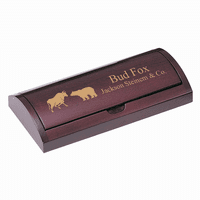 Recipient loved the business card case! It was beautiful and shipped very quickly!